The KG-UV3D features a long operating time (about 15 hours), thanks to the standard extended life 1700 mAh high capacity Li-ion battery pack. 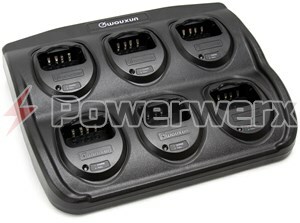 Software programmable via the optional low cost USB programming cable, or manually programmable via keypad. Customizable 6-character power on display message: Identify your radio by callsign or name on power up. Last radio state will resume on power cycle: Continue to work in single band mode or B-band after powering up. LED flashlight now works independently of the radio status: Utilize the flashlight feature while receiving or transmitting. The KG-UV3D is certified for Amateur Radio use and CE rated. FCC ID: WVTWOUXUN04. 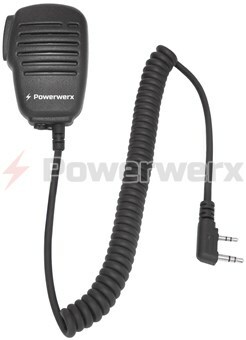 This amateur radio as sold by Powerwerx is limited to transmit within the Amateur Radio frequency ranges only. Windows PC programmable, free software available for download. Optional low cost cable (SKU: WXUSB) required. This throw-away-radio is increadible. It works as well or better than any rice HT boxes from Japan. Easy to operate after you learn the Chinese way to programing. Only draw back is the programing instructions fails to mentioned after step 9),that you must setup a com/port: Use any port above 2. And the driver for Windows 7 32/64 and Vista did not work in my system. The software is poorly documented but it works with Windows XP. In overall and for the price; it is worth the $100 bucks plus. Operational it's "A Plus"
I've had this nice radio for just over a week now. I am very pleased with the radio, and the ease of programming with the downloadeable software. The dual memory display is bright, large and easy to read. The fact that it does V/V, V/U, U/U and U/V is quite a nice feature. At 5 watts output on VHF and 4 watts on UHF is more than adequate for an H.T. 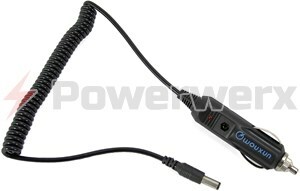 I very much reccommend this quality radio and the very easy folks to deal with at PowerWerz. Have had kg-uv3d for 15 months, first one I got was bad, no audio, returned it and received another one within 10 days, has worked perfectly now for over a year, very hard to program manually and manual isn't worth a darn, however with the downloaded program and cable it is a snap to set up.Good unit and good sales outlet, would recommend this unit. would get the pc set up as it saves 90% of time on set up. This is my very first radio and I couldn't be happier with it. While I initially programmed it with the software I downloaded from this site, but I've since misplaced the cable. But even as a rank amateur, I've been able to program this radio manually for both repeater and simplex use. I am a member of a volunteer emergency response group and several other members have this radio as well as many others. This little model holds its own alongside much more expensive radios. I've even been able to Rx & Tx from further away from a repeater than some of the more expensive models! I'm on a very tight budget and the affordable accessories are a big plus. There's always a 'wish list' but all I really needed was a slightly upgraded antenna. I've used it on several training exercises and public service events and it worked just great. I have to say this HT is really great. I have other various HT's from Yaesu and Icom and this one is super competitive. 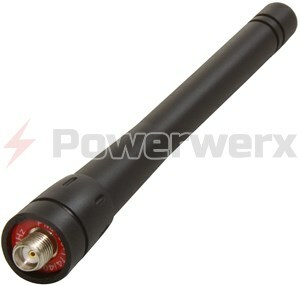 The one thing I did do, which I highly recommend, is I got the Powerwerx WXGAT-RV High Gain 15" Antenna for it. It gives you 2db on 2M and a really nice 5db on 70cm (at a nice price). The improvement was crazy, hit so many more far repeaters with the antenna. The battery speaks for itself, it lasts a long time. The built in flashlight and digital fm 76-108 is a bonus when out on a walk or bike riding. I was very suprised and impressed, I love this radio. I've had the radio for about three months and after getting some of the local repeaters programmed into it, it works better than I thought it would. I've had good reports when using it both as a handheld and a mobile. Programming was a little tricky for me, but after I figured it out, it was easy. I also have a VX 6 and actually like this better than the yaesu. I don't know if its possible, but I'd like to see a triband VHF/ UHF 6 mtr from this company. I've had my Wouxuns for a week now. It's a great little radio. I'm able to hit repeaters within 3-5 miles on 2 meters with the rubber ducky antenna. I bought two radios and for a test I configured them for 70cm simplex. Then I drove about 4 miles away with hills, valleys, trees, houses, etc in the way and was able to maintain contact the entire way. I didn't check maximum range as I ran out of road, but these are plenty good enough for me. I've got a slim jim antenna in my "go" pack so that I can get some good distance in an emergency. I am going to mount an Ed Fong j pole on my roof soon and I expect to get some really good range. 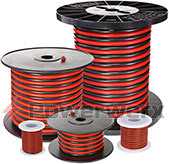 These are durable as well. A couple of days ago, I set one of my radios on the hood of my GMC Acadia...and watched in horror as it slid off the hood and crashed into the concrete driveway. I was sure it was going to be busted. But it was just fine, I've been using it for a couple of days and as far as I can tell it still works perfectly. Get the programming cable as it makes adding channels so much easier. It can be done through the menus and it's not that difficult, but much easier through the software. Make sure you get the right version with the freqs that you want. I am very happy with these radios, highly recommend them. I have had 2 Radio Shack handhelds, 3 Yaesu handhelds, and helped other hams program their handhelds of many other brands. My wife won this at EMCOMM West ant the first thing I realized Wouxun made a very impressive HT. I was able to learn hot to program with only a little trouble. When you figure out the platform it's easy. The run time is much longer than my VX5 lithium ion battery. "deck" test on the sidewalk while walking produced no damage on the case. I am so impressed with this I intend to buy one for myself and get the mics. for them. everyone told me to get the cable to program but that's my strongest place with radios, but I think everyone should do the cable.The only people I know that don't like them never tried them. those who have like or love it! My wife likes it better than my ft 250, and its a simple radio to use. 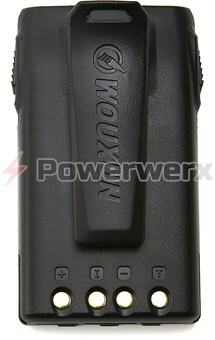 I ordered 2 of these radios and use them for amateur and commercial field. Very please with sound, quality and price. great portable. i work for the cable co. here in md and bought this radio to use with my co workers, i will know better in the next couple of weeks as to how it performs in the field. i have owned yeasu, kenwood, icom,and adi radios in the past and have not had any bad experiences with any of them. i am very hard on my radios so time will tell as to weather or not this radio will hold up but the price of this radio was perfect for what i could afford for a portable. i will keep u posted. Well its been a while but I still love this radio I have programmed four other Wouxun and changed and improved my frequency coverage without having to phone for help and beleive me that is something.What I like is the battery longevity and the feel of this versatile little radio. Its solid and comfortable feel is hard to beat at this price point. Great little radio for the price. I can use this with my companies radios perfectly. My only problem is that the LED flashlight stopped working after a month. I'm asp currently studying to get my Ticket. I have had a kg-uv1d that was my first ht. I also have a main brand name ht, but like the wouxun much better. It has a better range, and I can monitor local fire frequencies for a range of 45 miles. This radio is great for only 100.00. You can not go wrong. Powerwerx staff is wonderful as well. I had a problem with one and they took care of it immediately. Thank you for a great radio and great customer service. Received my radio late last Friday and had it programmed the following day. See my guide following these comments. From my operational tests so far, it fully meets my expectations. Once I get to use it more extensively, then I will checkout the accessories. I have on hand a Kenwood HMC-1 Headset with VOX which I will ask if this can be used with this radio. 1. Menu 1 = Step: I adusted mine to 12.50 khz . Makes for last digit freq selection to end in zero or 5. 2. Menu 23 = Adjust offset to 600 khz, then push menu and exit to store. 3. Menu 24 = Adjust up/down for + or - Lock again, menu/exit. 4. Prepare paper listing of about 10 vhf/uhf repeaters with offset + or – and PL tones. Note: Since this radio doesn’t automatically set the offset, I found it better to do the same offset, store in memory channel and then go to the next offset. 5. In frequency display, push A/B to select Band and enter Repeater Frequency. 6. Menu 15 = Select Receive PL Tone or adjust up and down or down to Off. Don’t forget to push menu/exit to lock in. 7. Menu 16 = Select Transmit PL Tone adjust up and down and lock in menu/exit. 8. Before storing, make sure that the correct offset is shown on top of display, Press menu 15 and 16 again to verify that your selection is correct.. Just press Exit after each check and anytime your not making a change. 9. Menu 27 = Select CH to store. I planned to store my vhf repeater freqs in Ch 01 to 19 and uhf from 20 to 40. After pressing selection, push menu/exit to store. Note that open Channels and stored channels display each time. 10. Same procedures above for each frequency selection. Memo: Don’t bother to check all the MENU DEFAULTS at this time except for language which should be set to English and Squelch 5 which is ok for now. 11. If you made a mistake, you can use Menu 28 to delete a channel. 12. Exit 21 to change the display from Frequency to CH. Keep a little cheat card of repeaters so you know the pertinent frequency, etc. Memo: Later on, you can use the procedures to change repeaters to a name. I found this not worth my time. 13. Now, you can go and select each Menu to verify defaults. 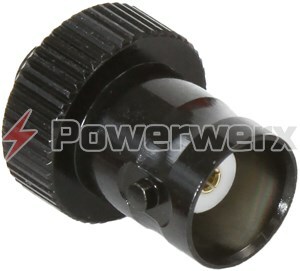 Also Note that you can also use the Rotary Encoder Knob for various uses. i.e. Channels up/down, etc. it is too closed. If I program # 4, it is too sensitive. Would rather have a kmnob to adjust to the bavkground noise. I can tell how versatile is this this incredible radio. I do have one and have spend with it about a year and a half, for real do not have nothing negative to tell about this outstanding low price and modern HT radio. I recommend for any one who are looking for quality and affordable price mastered rig. Excellent Radios and i do recommend getting the Antenna upgrade for additional power! It does everything it says it does !!! By KC2SUR - Al. Great radio !!! VERY cost effective and I can hit repeaters 30 miles away with ease !!! A breeze to program, adequate software and lots of useful accessories. The rig arrived 2 days after ordering, and I have been having a blast ever since !!! Japan, WATCH OUT !!! there is a new kid on the block !!! I have only had this Transceiver for 48 hours and i fell in love with it the moment i turned it on. Greatly Made product form both outside and In. I did not read the manual but programing manually is very easy and simple. Superior Audio Quality and Reliability. Speaker Quality is super loud at full Volume level and Very Clear. On video reviews people complain about the Antenna being cheaply made but i do not find this to be the case. for only $119 and some change for tax this is one heck of a deal. I recommend the $15.99 Lapel mic. and an Extra belt Clip. I have put it through it's paces already for my uses and have to say it's a hell of a deal. Powerwerx ships super fast too. i paid for it on the first and had it in my hands on the morning of the 3rd. and i did not pay for speedy shipping. This is a good radio at a great price. I own two of them and have been using the radios for two years. There are mostly 5 star ratings on this radio because people are very happy with these them. I am also very happy. I think most people including me are surprised to get two bands and performance for so little money. The radios are small, decently built and functional. The pros clearly outnumber the con's but there are some tradeoffs. 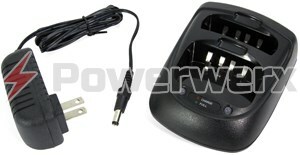 Pros: The radio is low cost with good performance although a higher gain antenna makes a marked improvement. Then again, a higher gain antenna made a marked improvement on my $500 Kenwood too. It just about the right size: small but not too small. The key’s light up which I love because I use my radios mostly before sunrise. The keyboard is simple although programming via keyboard is painful, but what radio isn’t painful to program these days. Most any technically needed configuration can be done on this radio, but it may require the software to get it right, or at least make it easier. 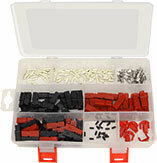 Locking and unlocking is easy enough to prevent accidental config or freq changes. I use this radio with a TinyTrak 4. Transmitting beacon works perfectly. Receiving only works on about 80% of the packets but this could be a TinyTrak issue. Finally, there is the Chinese voice (can be switched to English) that just makes it entertaining to program. Cons: The name of the radio makes it very difficult to say and talk-up thus creating a marketing challenge right out of the gate. The instruction booklet is difficult to read because of poor translation. The audio output will distort after continuous use. This is not a significant issue for amateur users. The distortion becomes noticeable and a nuance when the radio is used as a FM or weather broadcast receiver for more than 20 minutes at a time. The indicators for power meter, single strength and +/- offset are of little value because of the way they work – i.e +/- just tell you there is an offset but not which way because both +/- always display. The squelch can only be changed through the menu. These are some shortcomings, but then again I do not think these detract from the value. I knocked one of my Wouxun radios and my ICOM together off the counter top onto a hard surface floor. The ICOM came out with just a few more dents and scratches. 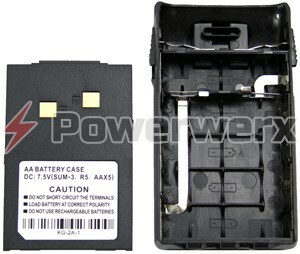 The Wousun's battery exploded; not as in bang, but as in parts of the battery went everywhere. No damage to the radio, but I think the battery took the full hit. Fortunately, the replacement batteries are cheap enough. I hate to think what would have happened if it had been the Kenwood hitting the floor. Finally, this isn’t really a dual band radio. It is more like a two-channel receiver and one channel transmitter, but I knew this when I bought it and works for my purposes. Changing primary channels and switching from two channel to one channel is easy. Overall, I do not see a need to use more expensive radios except for higher end functionality such as digital or cross band repeating. This radio is definitely a good buy – now if they just made a mobile (rumors one is on its way). I got my uv3d for Father's day. Had to take a buisness trip,and took rig with me. I was able to program different files to cover home as well as areas around the country I visit. The wx monitoring is great, and I love the cm bcast feature while fishing, I can listen to news and music while out fishing. The police frequencies are heard loud and clear. Great rig for little money. Hi -- I've had one of your uv3d radios for some months, and have spent hous trying to program it with a computer. The problem is with the prolific driver. But that's ok. I've got lots of handhelds, and don't need more. I am new to amateur radio having just recently gotten my Technician class license. The Wouxun KG-UV3D is the perfect starter radio. 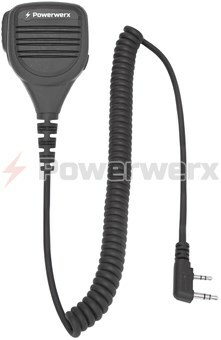 It is inexpensive and has superior audio quality. There are a lot of features that you can use to put your learning into practice. I would give it 5 stars except the user manual is only an average translation of Chinese to English. A few things I needed to Google for extra information. That said, the audio quality compares extremely favorable to expensive, high end motorolas. Great Deal for this Dual Band Radio! Shipping and Delivery was speedy! I also bought the optional USB cable, but found it easy enough to program by hand after pushing buttons and twisting the encoder knob for a few hours. The cable and programming software make it quicker, though. The free unlock software enables it to TX throughout the entire range. The transmit and receive audio are quite good. Tough little radio, too. My 7 year old "Deck Checked" it from about three feet to a hardwood floor with no damage or marks left behind. It fits perfectly in my average sized hand, and feels substantial without being too heavy. The flat base lets you set it down while the antenna remains vertical. The shape and contours of the case make it pleasing to look at. 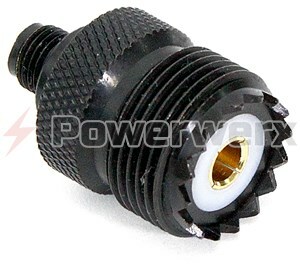 The volume and encoder knobs are solid and do not bind. I like the action of the back-lit buttons; they're not "floaty," and a tactile "click" lets you know you've actuated them. The dot-matrix LCD gives a nicely colored glow without being too bright. The flashlight comes in handy. I use the FM Broadcast receive quite frequently. While not "Great" for music, it works well enough for morning talk shows. Battery life (1700 mAH) is more than adequate for my operating habits. Drop in charger is a bit lightweight, but functional. The stock RD antenna is adequate for my needs. I am able to carry on simplex QSOs from inside my home at one watt to a friend 1 mile away on his. Local repeater work is fine business as well; I will be getting the SMA-RP/BNC adapter and an after-market whip anyway. The belt clip seems flimsy, but it's the only place to put the hand strap. The "not so greats" that others have noted are not severe enough for me to give a less than "Five" rating. All in all, well worth the price I paid. Would I recommend this unit to a friend? Yes, and twice on Sunday. I might even buy a few more for myself. Great Radio By Kevin K.
I love my radio. Love it so much I have talked my entire Rescue Squad into buying them for our radio system. We already own a Repeater and this works great with it. Everyone should own one of these. I got the radio and unlocked with a program I found online for the older models. Works perfect have been able to dual band in SnR with local LEO and other searchers. Last I checked the reviews of the Wouxon on this site, they were all 5's. Even though I like the unit and have had fun with its operation, it seems like there are some short comings that would preclude a 5 rating. 1. The transmit audio is not up to the receive quality. I base this conclusion on my radio and two others owned by nearby hams. Reports are good, but I have recorded the Wouxun along with my other handhelds and the Wouxun has a distinct tinny touch to the transmit audio. I hear the same artifact in the other two Wouxun radios. 2. It seems like with all the timers available something could have been dedicated to a power-off timeout. I find that feature quite helpful in my other units and more useful than a stopwatch. 3. There are the other minor issues like a signal meter that conveys no strength information. Not major things for a very cost effective radio that also has some nice strong points, but an overall 5? A great price doesn't overshadow evrything else. Having programed the W-KG-UV3D and used it over two months I find it is the Radio I carry the most. 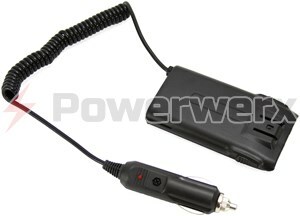 I will be purchasing the 2M-220 hand held so I can set up a 220 Repeater in the City. I have mainly Icom radios but this little low cost Radio is just too good to miss and with free downloads You Can Not Go Wrong!!! 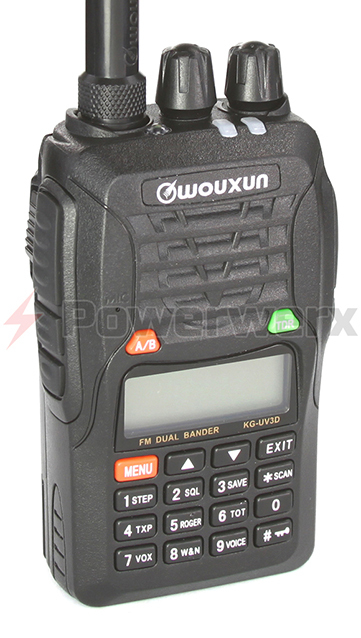 I own a KG-UV3D 2/440 radio and for the price and performance; it CAN NOT be beat. I don't have to worry about loosing it or let someone borrow it and forgets to return it. 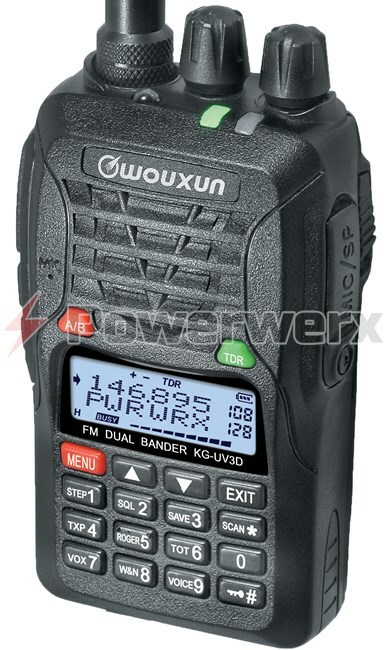 Simply put, you can buy several Wouxun units and still be ahead (money wise) over those other expensive oversea radios with similar functions.